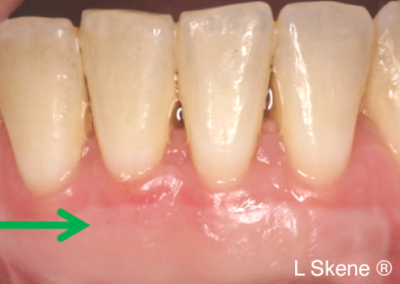 This patient’s gum tissue is so thin that you can see her roots through her gums. She is sensitive to cold and has discomfort during brushing. Notice how thick her tissue is after her gum graft. She is comfortable brushing, and her roots are not longer sensitive to cold. 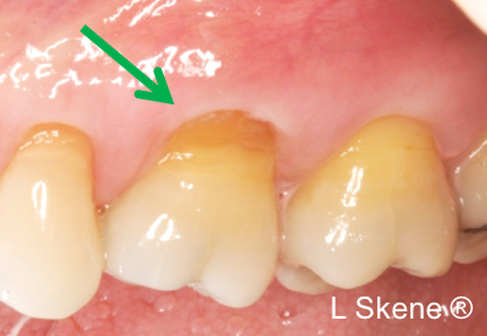 This patient has thin gums and the roots on his molar are exposed. 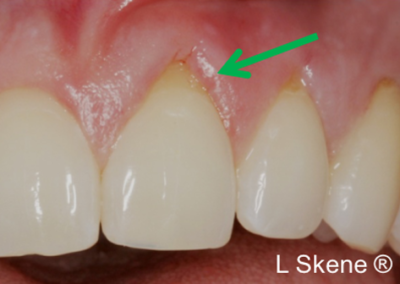 The gum graft protects his root surfaces and increases the thick tissue along the gum-line making it less susceptible to recession. 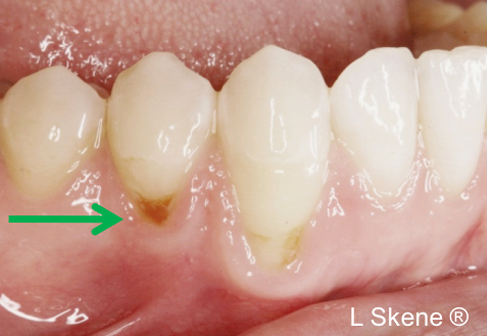 This patient has decay on her root surfaces. Exposed roots are more susceptible to decay because the surface is softer than enamel. The decay was removed and gum grafts were placed over the roots. No fillings were required. The thicker gum tissue now protects the roots and prevents decay. 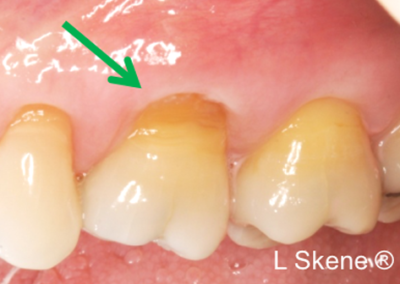 This patient has exposed roots and prominent notching on the side of her molar. Gum grafting has helped to protect her teeth from toothbrush abrasion. 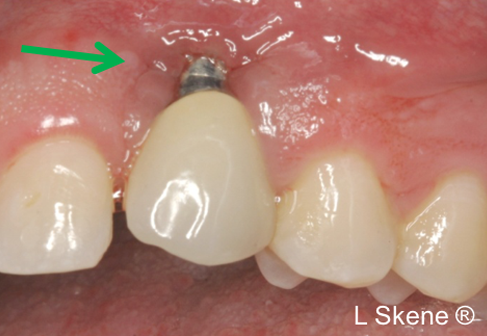 This patient has exposed metal on his dental implant. The tissue is inflamed and unsightly. 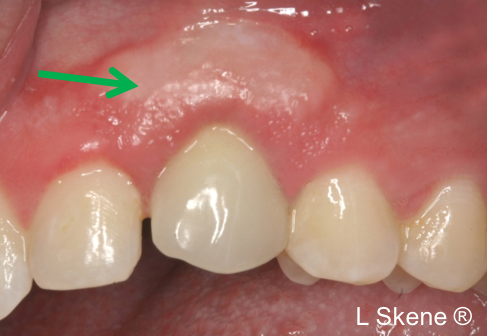 After gum grafting the tissue is thicker and healthier. 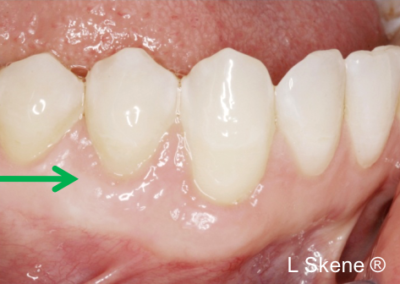 The implant surface is protected and the gum-line is esthetic. 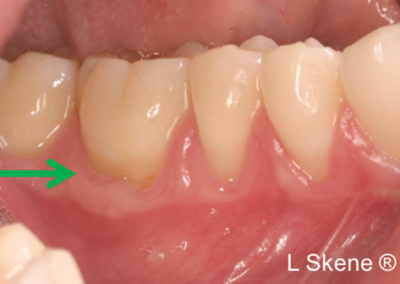 This patient has exposed roots that are difficult to clean and are unsightly when she smiles. Gum grafting has created an esthetic gum-line and smile. 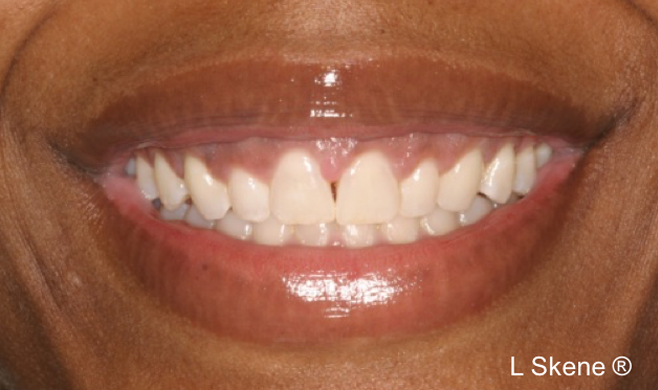 After crown lengthening her teeth are exposed revealing a brilliant smile. 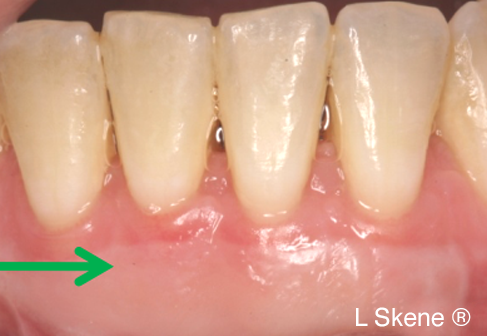 After crown-lengthening oral hygiene is facilitated and her teeth are visible. This patient has been missing teeth since birth. 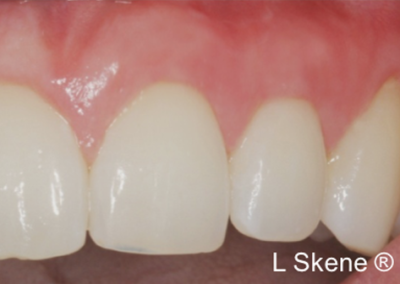 Implants with temporary crowns were placed in one visit. 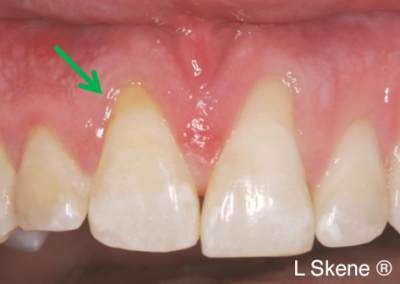 This patient had multiple failing teeth. 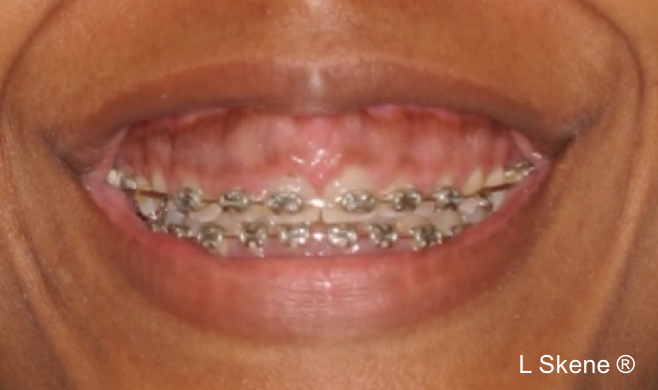 All of her teeth were extracted and implants were placed the same day. She left with a full set of teeth. This patient has deep periodontal pockets between his molars. The numbers above his teeth represent the pocket depths. Pocket depths of 3 millimeters or less are considered healthy. These are the new pocket depths 6 weeks after corrective gum surgery. Notice that there is space between his teeth so that he can access the roots to clean between them. 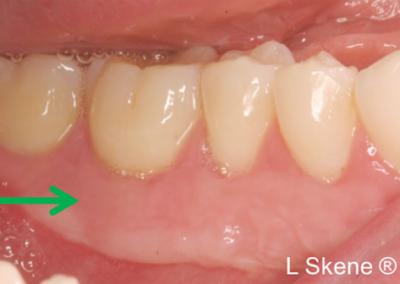 This patient has been missing teeth since birth. 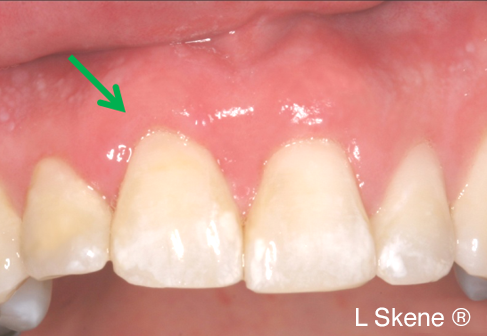 Notice how the gums are thin and concave. 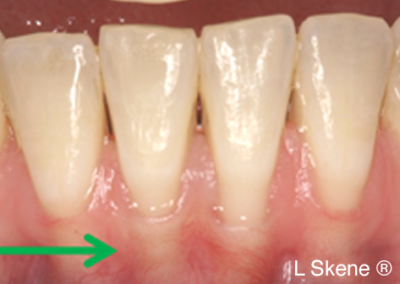 After bone grafting the tissue is thick and the underlying bone is wide enough to accommodate implants. 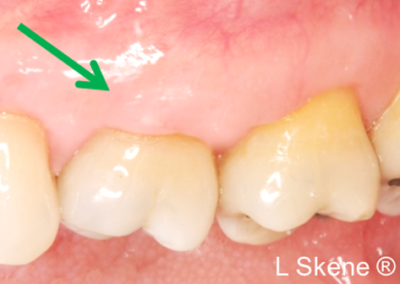 This patient has a deep infection in the bone behind his back molar. The defect was measured with an instrument and the x-ray displays significant bone loss. During surgery the defect is cleaned and a bone graft is placed into the space. Note: Bone graft material is purchased and is packaged in bottles. It does not require a separate surgical site. A collagen sheet is placed over the bone graft to hold it in place and stitches are used to secure the gum tissue. After two weeks of healing the tissue is pink and healthy. Stitches are removed. After 4 to 6 months of healing the underlying bone has healed and the x-ray shows how bone has filled the defect. As a result the patient was able to keep his tooth.